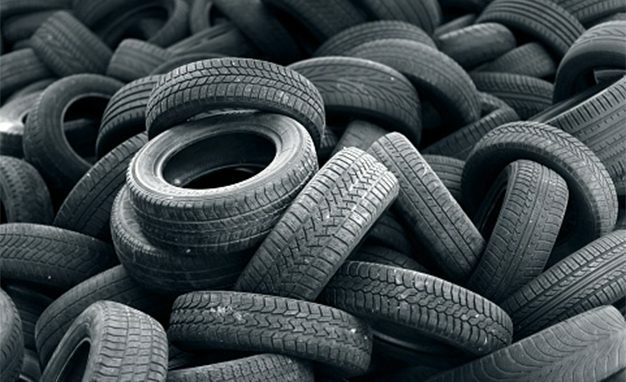 Obsolete tires are a type of waste that, with the development of economy and more precisely the automotive industry, is forming in particularly large proportions, with only about 20 million tons of old tires being produced annually in Europe. Consumer society and the desire of mankind to obtain more and more leads to the sale of more and more motor vehicles that over time generate more and more obsolete tires. The main generators of obsolete tires are transport companies, urban and interurban transport, international bus transport, construction companies, quarries for inert materials and ores, agricultural machinery and ordinary citizens from their vehicles. The environmental problem with tires that are out of use is that they are not subject to natural decomposition and can cause great environmental pollution when discharged randomly into nature. Another problem that is typical of tires that are out of use is that they are highly inflammable and, in the event of a fire, continue to burn for a very long time, making it very difficult to extinguish them. Most countries find it difficult to solve the problem of recycling or utilization of obsolete tires by using different methods. One of the tire recycling methods is to cut them into smaller pieces and then use them as a raw material for pyrolysis machines where several derivatives are formed that can be used to heat the process, recyclable metal, carbon and pyrolytic fuel. This method is not widely applied in most European countries due to the fact that it is very difficult to find application for carbon and pyrolytic fuel. Another way to recycle the obsolete tires is to regenerate them, using the tire base (the carcass) that remains robust after the upper tire is worn, the so-called protector. The tire carcass can be used for regeneration because its structure is built to be used more than once. The process involves placing a new protector on the carcass, then performing tire vulcanization (sticking the protector to the carcass) under the influence of high temperature and pressure. This method is used extensively because the properties of the regenerated tires are close to those of the new tires and provide a new life for the tires that have become obsolete. Tire regeneration is mainly used for cargo tires, because there is the greatest economic impact of these tires, and in this way the need for obsolete tires is reduced. The next method by which recycling of the obsolete tires is performed is the preparation of the granulate. The process consists of the reception of whole tires which then pass through several cutting machines (shredders) equipped with screens of different hole sizes, then pass through a mill and a metal separator where the metal is separated from the rubber. The resulting fraction then passes through a textile separator where the fabrics are separated from the rubber and the resulting product is rubber granulate. The granulate has a wide application in various activities – the manufacturing of rubber floor coverings for children’s playgrounds, rubber flooring for sports facilities, asphalt paving, and the use as a protector for the regeneration of tires that have become obsolete. In some European countries, the granulate is used for innovative solutions by producing rubber pavement blocks, roadway dividers, concrete insertion and others. Another approach to resolving the problem of obsolete tires is their utilization in order to emit energy or, in other words, to burn them in cement plants. The drawbacks of this method are that tires are not recycled to form raw materials for secondary use, but from another point of view, the problem of the vast number of tires that are out of use is solved worldwide. Tire burning takes place in special furnaces equipped with special emitting systems equipped with high-tech filters to preserve the environment. In conclusion, it can be said that tires that have become obsolete are waste, for which in the future it is necessary to seek innovative methods for recycling.